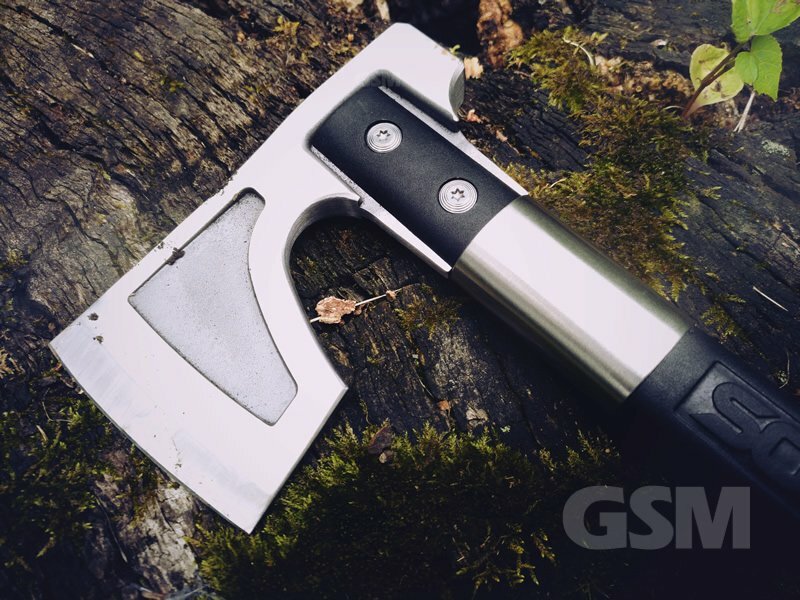 The new for 2017 SOG Camp Axe features a nicely constructed Stainless Steel blade in a compact size that will make quick work of any tree limbs or roots in your immediate area as well as breaking up firewood to pop into the fire. 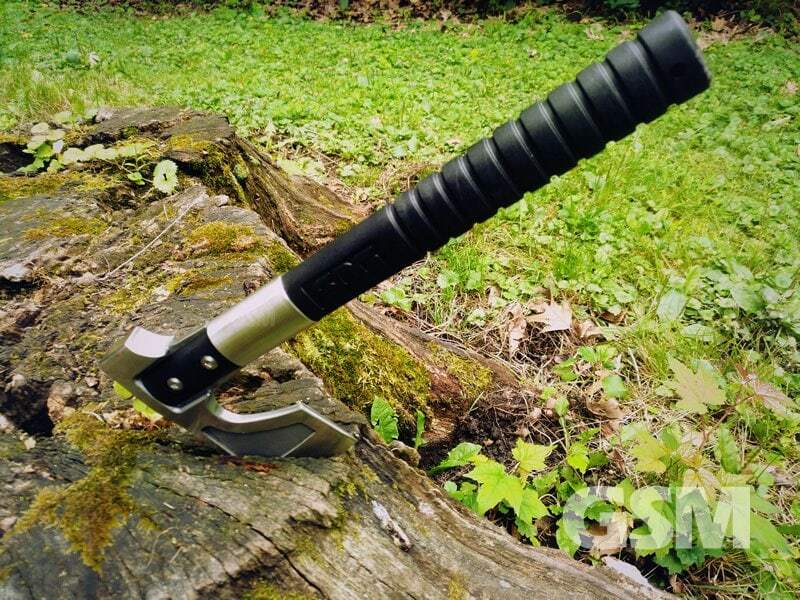 SOG’s new Camp Axe isn’t a Tomahawk and not really made for throwing but that didn’t stop us from trying. The Camp Axe is weighted very nicely and gives a predictable rotation so it’ll work. If you can throw a blade/axe you can absolutely throw this one with some accuracy. Scroll to the end of the article, you can see a quick video below of our one handed throw. 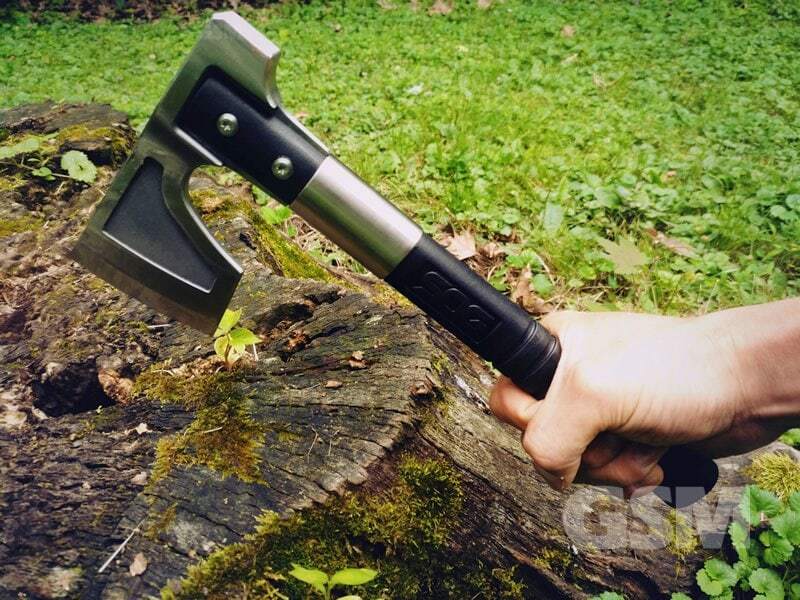 The Camp Axe measures 11.5″ tip to tail and weighs 16.10 oz. The blade itself is 3.1″ and thankfully comes with a sheath to keep the blade and you protected. 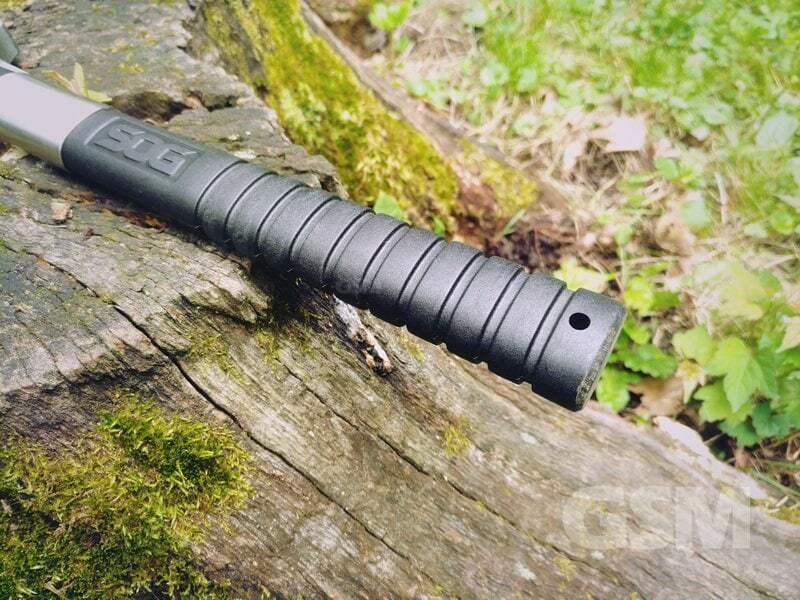 The Sheath appears to be made of the same nylon reinforced glass that the handle is made of. It fits perfectly over the blade and snugs nicely right on without falling off. 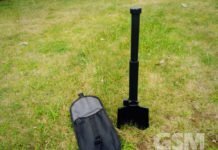 Additionally the sheath also has a rubberized strap that wraps around the back of the axe and secures back onto itself as a safeguard. Initially we thought the handle being so thin might transfer some vibration to the hand and cause some uncomfortable feeling when using it. This is not the case, the glass reinforced nylon handle is quite sturdy and feels great in hand when chopping, however the handle could be a bit thicker for some. 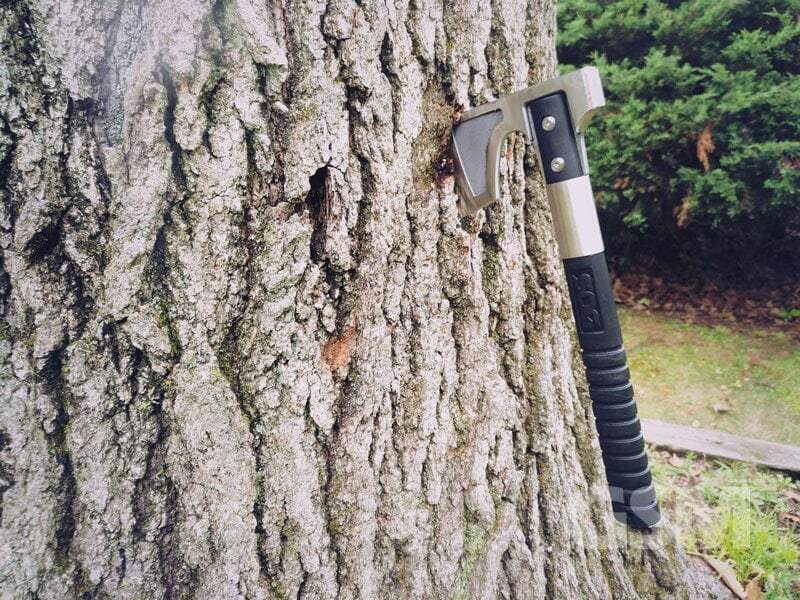 We haven’t tested SOGs Camp Axe it to its break point, the stainless steel blade seems pretty tuff. After repeated throws and chops and general fooling around over three days, we’re not seeing much of anything except some scuffs on the nylon glass reinforced handle. Although you can certainly chop through some larger moderately sized tree’s, smaller ones are easy enough to chop through. It’s balanced nicely but it doesn’t carry the weight of a full sized axe, therefore you will not get the type of deep cut you might get with a full swing on a full sized axe. 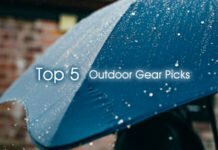 Where SOGs Camp Axe works well for chopping up precut firewood into smaller pieces, cutting off smaller branch limbs to clear an area, hammering in tent stakes. It excels at chopping off foliage, branches/small brush from larger branches so you can gather material for a temporary shelter. It’s compact but much nicer and substantial than the SOG Knives stock photos. 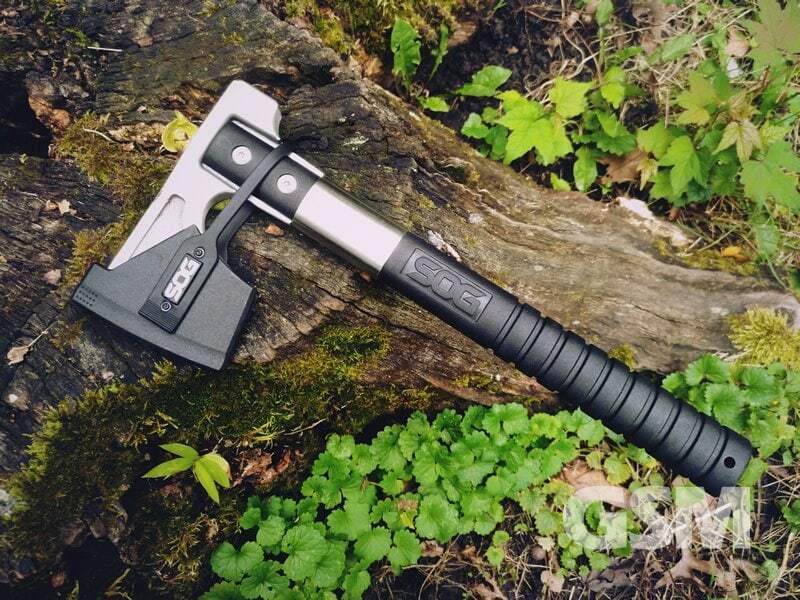 The new for 2017 Camp Axe from SOG is a great little axe to have with you in the field and an awesome addition to your camping gear. 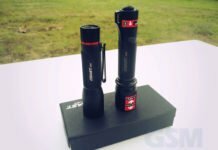 It’s well made, sturdy and the compact footprint makes it great to take along with you on camping trips.